BloodSample processing at UG ID lab for KHV antibody serology. The following is an abbreviated comic of the process. The Koi Herpesvirus serology test is a classic viral neutralization assay run in koi fin cell culture line. 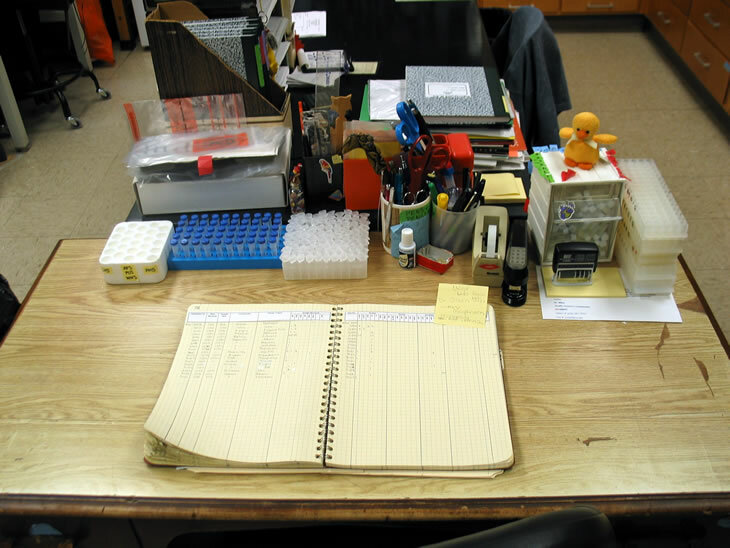 Specimens are initially" logged in" at the Infectious Diseases Labroratory. 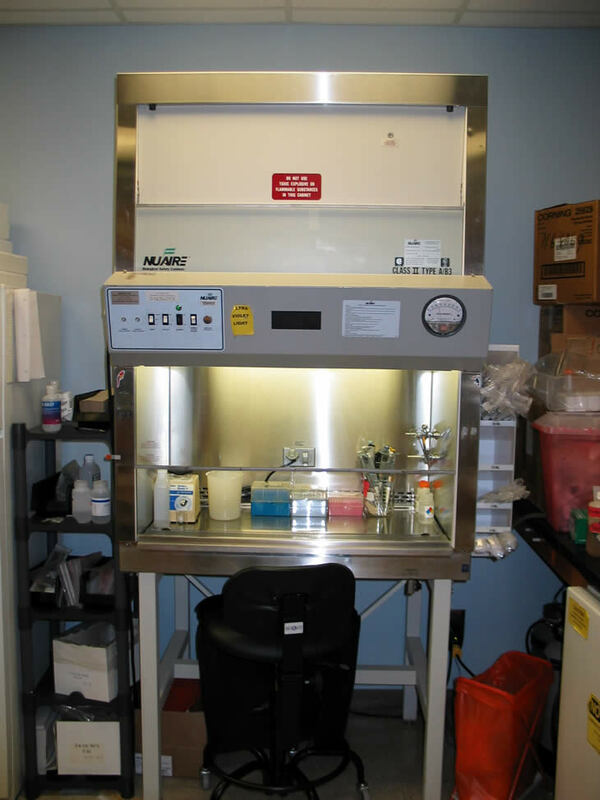 Inital processing of the sample takes place under sterile conditions under a hood. 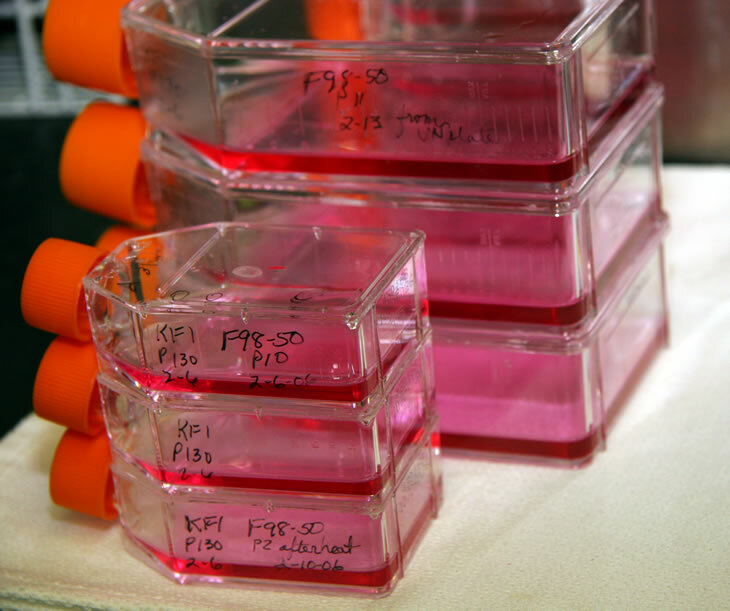 This may include separation of the plasma or serum from the red cell mass in the submitted specimen tubes. In another laboratory area, the Koi Herpesvirus is grow in tissue culture in the koi fin cell culture line. 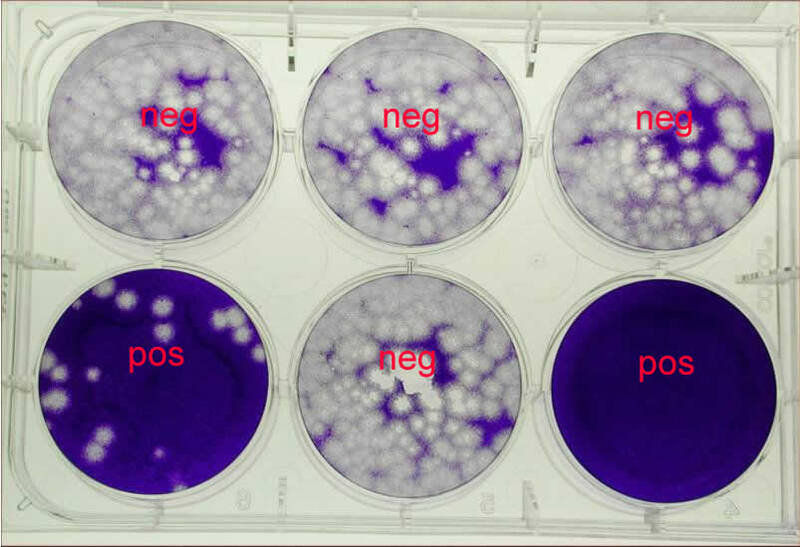 In order to perform the virus neutralization assay, adequate virus must be grown in order to perform the assay. The relatively slow growth of the virus is one of the factors limiting the number of assays that can be done in a given time period. Sterile flasks of the koi fIn cells are propagated in order to grow the Koi Herpesvirus. In order to run the VN serological assay, adequate virus and koi fin cells must be grown in advance of doing the anti KHV antibody assays. This process cannot be rushed, and, with current equipment, is a very labour intensive process. Labaratory where KHV is grown in tissue culture and VN serological assays to anti KHV antibody are performed. Later in the virus neutralization anti KHV antibody measurement process, the serum or plasma from the blood sample obtained from the fish is diluted. After an inital 1:10 dilution, a standard 1:2 dilution is done (1:10, 1:20, 1:40, 1:80, etc.). This diluted plasma or serum is mixed in sterile containers with Koi Fin cells and a measured amount of KHV. 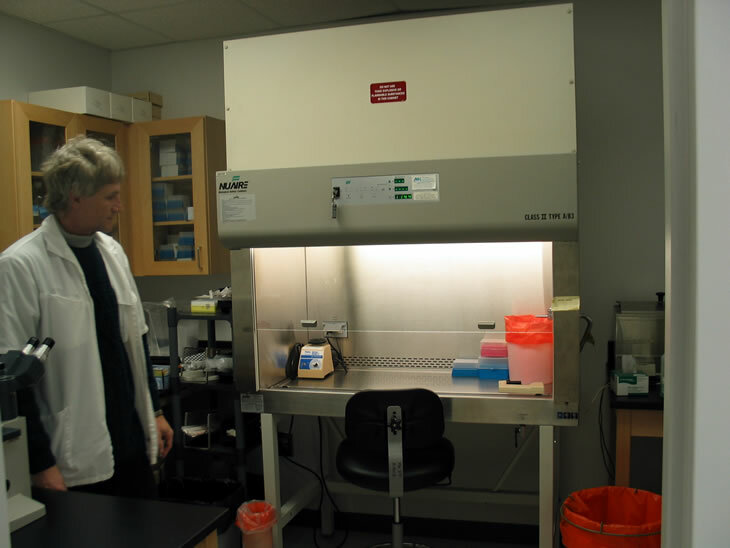 The Koi fin tissue culture, diluted specimen, and KHV are incubated together at room temperature for a week. The cultures are then fixed and stained. The colonies of KHV growth are counted. When there is antibody present, the virus does not grow or growth is severly inhibited. photo courtesy of Branson Ritchie, D.V.M.,Ph.D. A Virus Neutralization anti KHV antibody assay. The tissue cultures of Koi Fin cells, diluted serum or plasma from blood samples, and KHV have been incubated at permissive tempeeratures. The plates have then been fixed and stained for ease in colony county. The virus grows killing the Koi Fin Cells in discrete colonies. In samples where antibody to the KHV is present, the virus does not grow or is severely inhibited. Without extreamely expensive equipment, the process must be done manually, including the colony counting. Clearly this is a very expensive and labor intensive process which is primarily utilized in vaccine research. The virus neutralization antibody assay measures only biologically active antibodies against KHV. While extreamly specific for antibody to KHV, the test is labour intensive, expensive and slow. In comparison, an ELISA to KHV antibody is faster (hours rather than days) and less labour intensive, however with greater risk of false positives. At some future time, If the volume of testing requested increases significantly, we might speculate it may be necessary for us to do ELISA tests as the inital "screening" study with VN assays on the "doubtfuls or positives". As the VN assay was in part developed with funding from the koi community, the researchers and university have made the study available to the koi community at "cost". 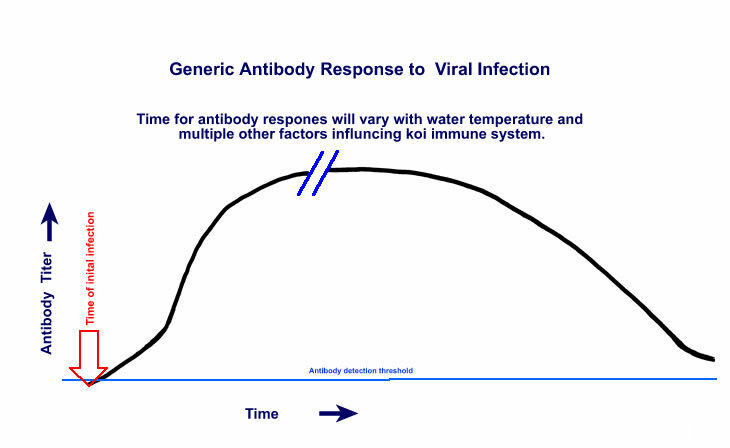 Diagramatic representation of antibody response to infection with the KHV virus, assuming koi survival. Multiple factors will influence the ability of the infected koi to mount the initial immune response to infection and seroconvert or form antibodies against the KHV virus. A major determinant of the speed and strength of the immune response is water temperature. It is currently unknown how long the immunological window for antibody detection lasts. Ultimately immunity is felt to be conferred by cell mediated processes. At the time of inital infection, a fish which has never been exposed to KHV would not have detectable levels of antibodies to KHV. At permissive water temperatures, most fish with a robust enough immune system to survive, will form detectable levels of antibodies within 2 - 3 weeks. To be on the conservative side, we draw blood after the fish have been in quarantine for at least 4 weeks at permissive temperatures. If the koi had been exposed to KHV and contracted KHV but had been kept at temperatures below that optimal for viral growth, this timing should be appropriate for detecting those fish which may seroconvert without showing signs of KHV disease. The dilution of the serum inhibiting growth is the "titer" The higher the dilution (or titer) which inhibits virus growth, the greater the amount of antibody present. Any amount of antibody present indicates the fish has previously been exposed to Koi herpesvirus and has mounted an immune response to the virus. If we accept KHV as a herpesvirus, persistant infection (true latency or chronic low grade infection) is present by definition(at least in those herpervirus which have been adequately studied). If persistant or latent infection exists, intermittant shedding of virus durning the koi's lifetime is possible. Blood samples drawn several weeks apart can provide additional information about the state of infection. Rising titers of at least four times higher on samples collected several weeks apart is consistant with acute infection. If the titers are falling by a factor of four on samples collected several weeks apart, it would indicate the koi immune system has been exposed to the virus and the antibody levels are starting to decrease, suggesting the recovery phase. A constant (usually low) titer suggests the fish has been previously inected and has mounted and immunological response. After an undetermined time, the antibody levels to KHV may fall to undetectable levels, the immune protection being conferred by other cellullar mechanisms. One fish, one sample, one test! Samples for KHV serological testing should not be combined!